It was probably there before, but we noticed NYC and the Verazano Bridge at 20 miles away. 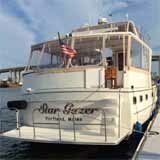 We are just 1.5 miles due north of the Statue of Liberty at Liberty Harbor Marina on the Jersey City side of the river. The big bay and open ocean running are behind us. Both bays and the ocean took only four days. I never thought it would be that quick. We did miss a lot on the Chesapeake. We just skipped past the 10 mile wide mouth of the Potomac with all that is up there, and missed Annapolis. It was just a short hop up the Delaware if we would have wanted to visit Philadelphia. We also skipped by Baltimore. We passed by a lot. Many people spend their whole life boating on the Chesapeake. There is no way to miss NYC, however. It appeared on the horizon when we were 20 miles away. Entering New York Harbor was our most dramatic cruise yet. 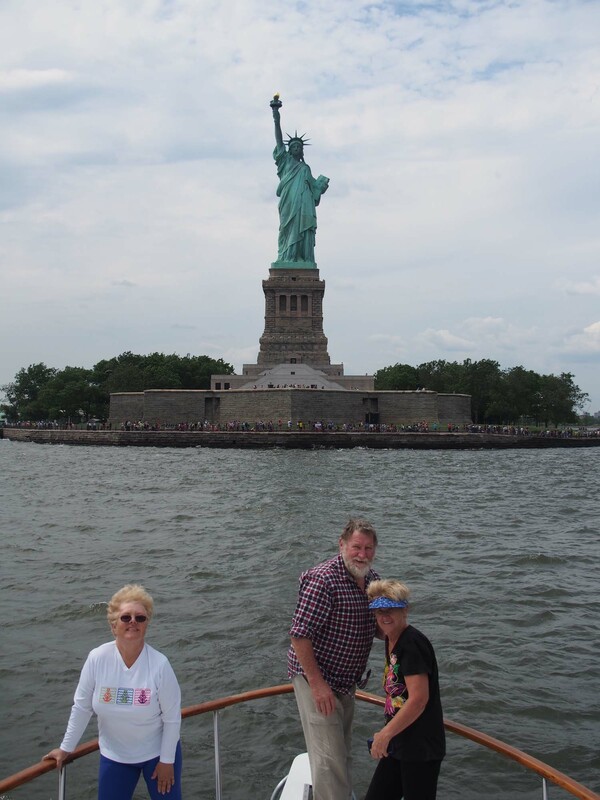 We went right up to the warning buoys a few hundred feet from Liberty Island and took some pictures. 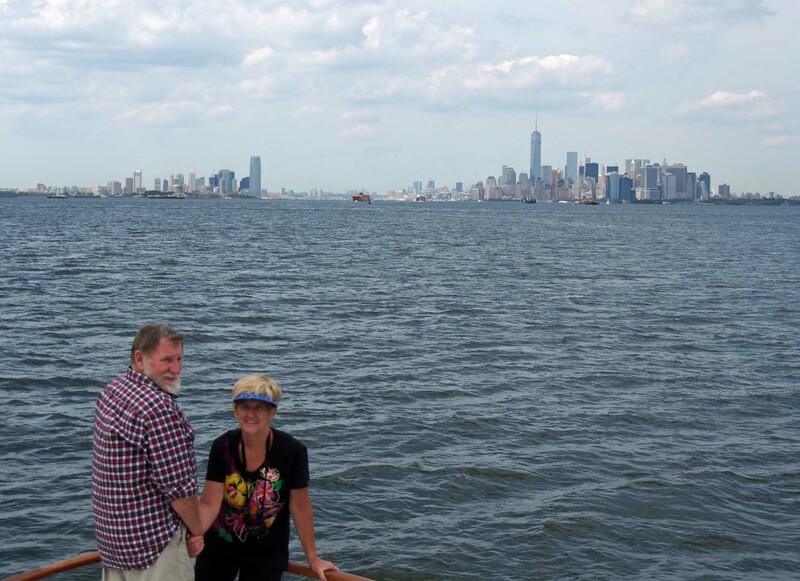 Keith and Gayle with Jersey City on the left and Manhattan on the right. 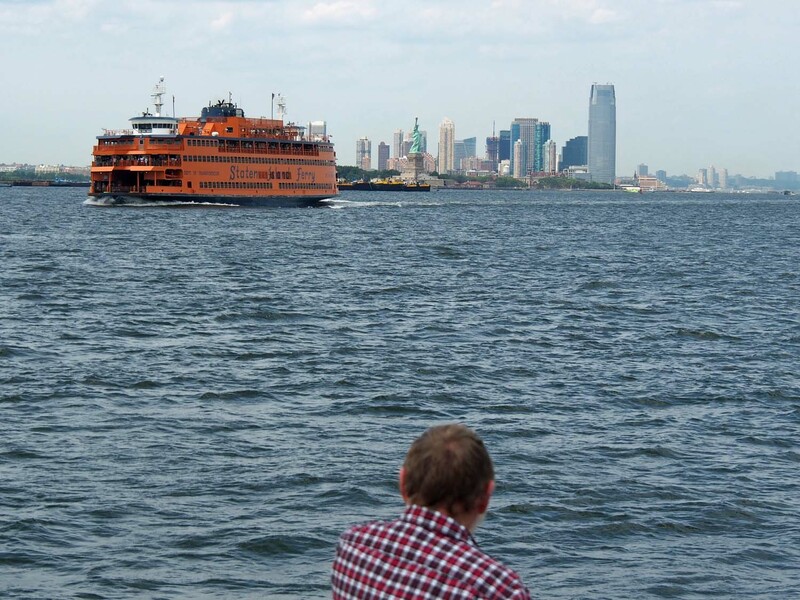 Keith (and I) see the Staten Island ferry for the first time. I’ve heard about it many times in movies. Liberty Harbor Marina is one of the few protected docking places right by Manhattan. With their lock on the market they don’t run as tight a ship is they might, but we got in OK after going over things several times with the staff, most of whom were new and did not know much. I need to know that a slip is wide enough before I back into it, since I can’t see well back there. No one knew anything about slip widths. I had parked the boat at the fuel dock for a pump out, and so ran over myself to check them out. The docks were at various angles so I could not put a tape on them to check. I’m going to get a laser measurer next time I’m at Home Depot. At the Statue of Liberty just before going 1.5 miles more to our marina. We finally found a slip obviously wide enough and got quickly settled. The ladies wanted to walk the four blocks to the subway into the World Trade Center. We saw a bit there and ate at a pub. There was a very light drizzle much of the time, so we did not stay too long. All four of us (separately) stayed in NYC just a year or two ago so one night there will be enough. We need to get up the Hudson and our goal of the Erie Canal entrance by July 1. Looks like we’ll make it. Happy Fourth to Jack and Sue! Wonderful pictures! Glad the boat is back in business and you are having a wonderful time!